Have you ever wanted to ask a question to thousands of people? 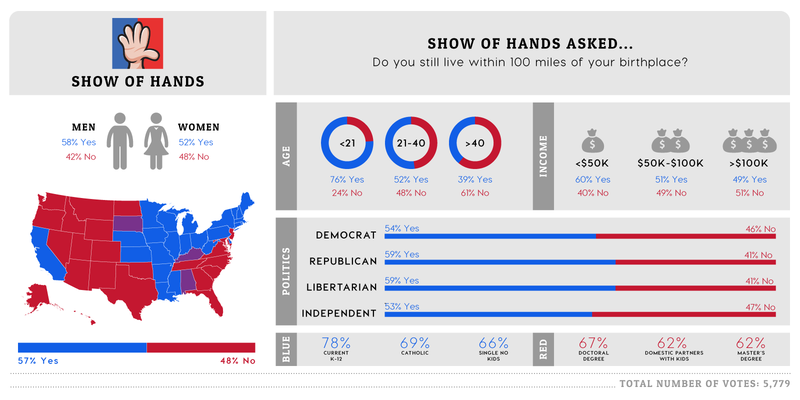 Have you ever wondered how different people around the country might answer the same question – or how you might stack up against them? Have you ever wished for a safe and fun environment to debate thoughtful (or trivial) political questions? Then join us! Come for the polls, and stay for the community! Answer and ask questions. 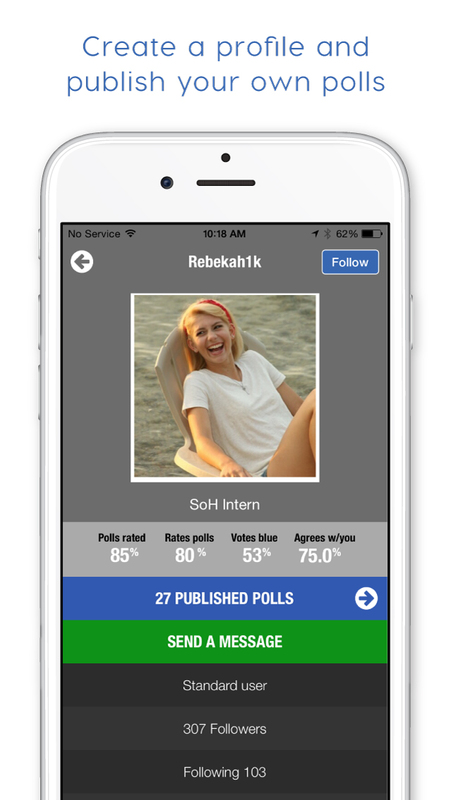 Polls range from funny and silly to highly political and thought-provoking. Question Everything! 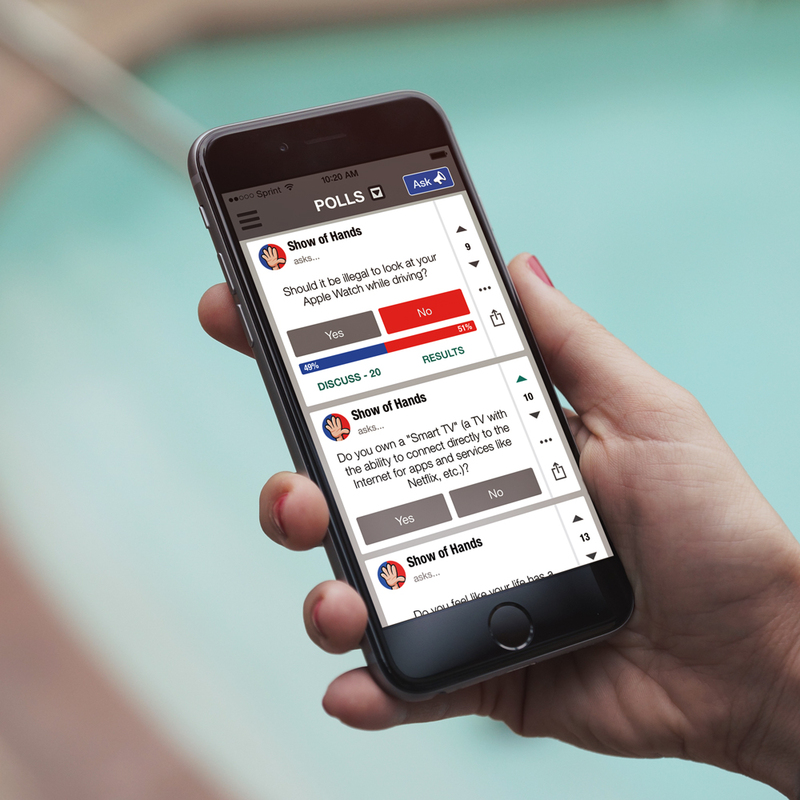 New, intriguing questions are added constantly and cover a wide range of topics. Download on the device of your choosing. We support iOS 7+, Android 4.+, and Amazon Fire. If all those fail to meet your needs, you can use us on the web! Interact and debate with an active community of enthusiastic users. Offer your thoughts on a question and use rational arguments to challenge others and explore important issues together. No one will ever know how you voted! If you love Justin Beiber, your secret is safe! Use the app anonymously to answer and ask questions without giving us any personal information. Thoughtfully express your opinion and points of view. Grow your own following or debate with other users in the comments section– you might even make some lifetime friends! 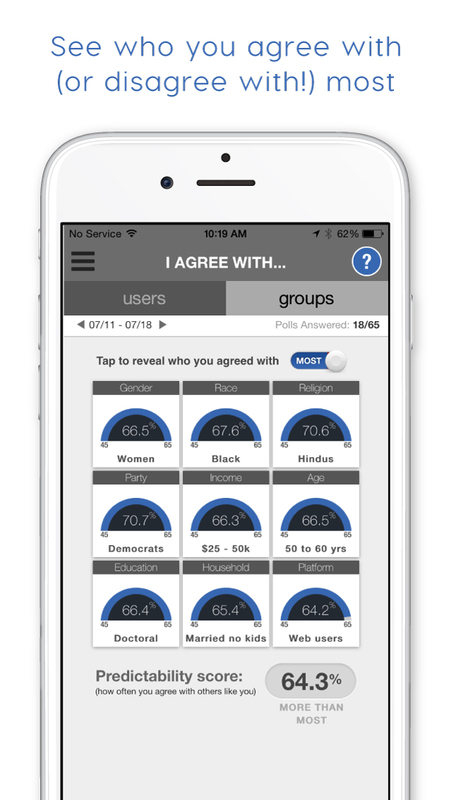 Broaden your perspective and gain interesting insights from poll results. The data is categorized by major demographics– age, gender, income, and more. Opinions are powerful little buggers – sometimes even more so than facts. 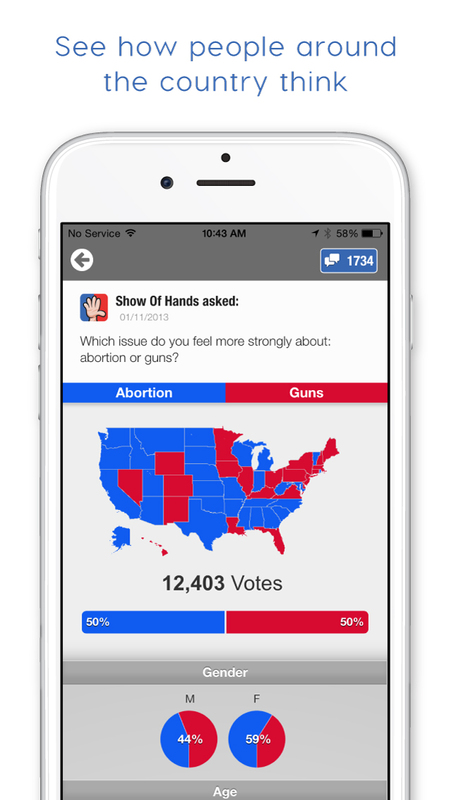 Show of Hands is a fun and powerful way to peer into the brilliant and warped minds of people around the country. 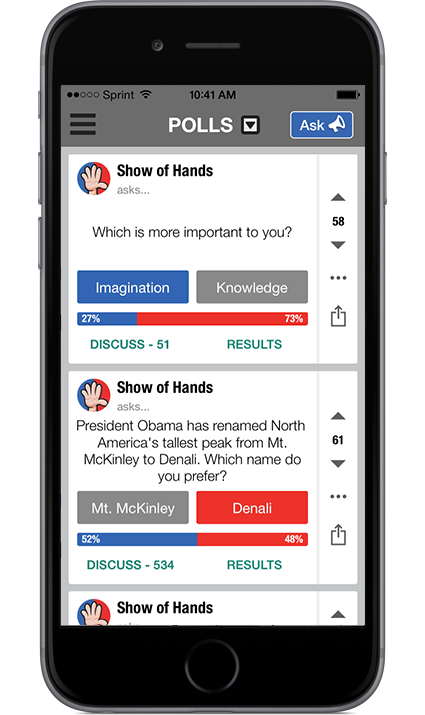 Answer questions daily and see instant results sliced and diced by age, gender, income, party, geography, and more. Build a following and ask them your own questions. Win arguments, bets, and the admiration of millions. You can also use Show of Hands with co-workers or customers, if you're all business-like that way. Whatever your goal, be smarter about it, champ. Do YOU have questions!? Have you ever been having drinks with friends-- or even just around the water cooler with coworkers-- and gotten their opinions and comments on something? 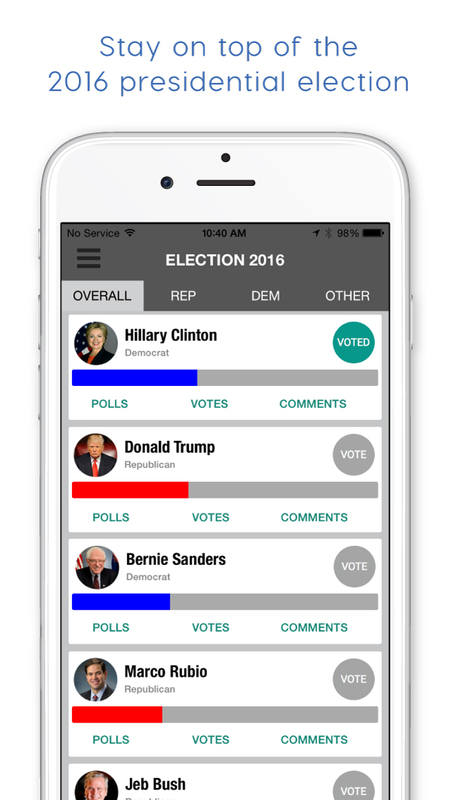 Build an anonymous Show of Hands following and publish your own polls to test if your opinion is in the majority! Ask your own questions about politics, ethics, pop-culture, humor, sports, health, election 2016, news-- or anything else your brain can think of! Poll responses broken down by different segments. Ask, answer, and comment on questions. 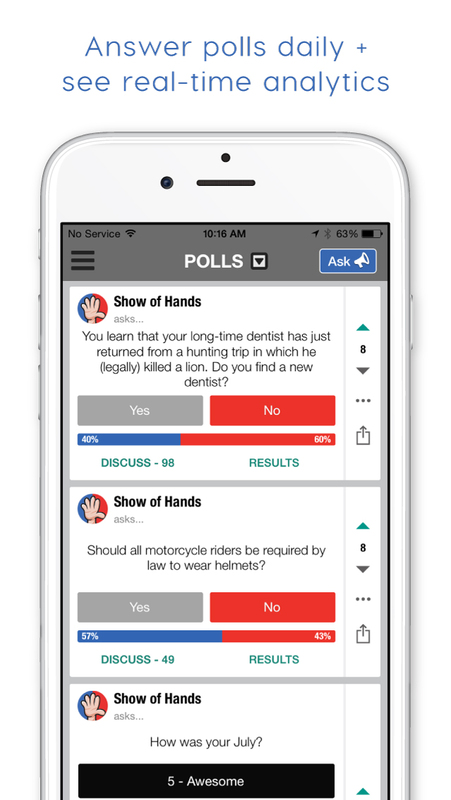 Show of Hands is a smart and fun community polling platform for people who love burning questions! We have hundreds of thousand of questions answers. Below are just some of the results! In relation to politics, did you know that more Libertarians pee in the shower then the other parties? Click on the header to find even more amazing stats! In relation to gender, did you know that more Women believe the "American Dream" is dead than men? Click on the header to find even more amazing stats! Copyright 2015 Show of Hands, LLC. All Rights Reserved.